In probability theory and directional statistics, a circular uniform distribution is a probability distribution on the unit circle whose density is uniform for all angles. where is the Kronecker delta symbol. The mean angle is undefined, and the length of the mean resultant is zero. where is the Bessel function of order zero. There is no known general analytic solution for the above integral, and it is difficult to evaluate due to the large number of oscillations in the integrand. A 10,000 point Monte Carlo simulation of the distribution of the mean for N=3 is shown in the figure. where is any interval of length . 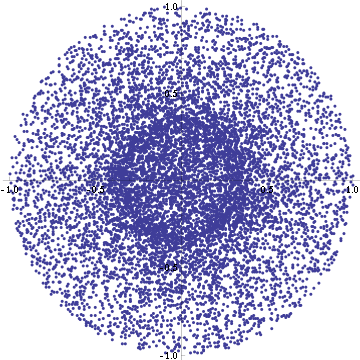 This is the maximum entropy any circular distribution may have. 1 2 Jammalamadaka, S. Rao; Sengupta, A. (2001). Topics in Circular Statistics. World Scientific Publishing Company. ISBN 978-981-02-3778-3. Retrieved 2010-03-03.